Dan Taylor has been selected to play for Warwickshire under 16s. 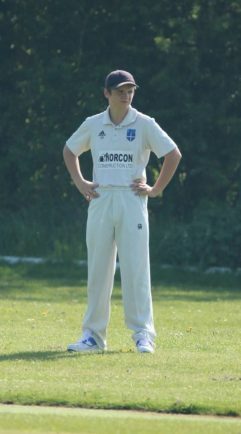 STUDLEY CC junior Dan Taylor has been selected for the Warwickshire under 16s squad for the 2018 campaign following a series of trials. Taylor, who made his first team debut in August 2017 after impressive performances in the club’s 2nd XI, has come through the ranks at Studley, playing junior cricket before being ever present in the senior sides in 2017. Studley secretary Sean Weller said: “This is great news for everyone at the club. We invest heavily into our junior section and it is bearing fruit. “Dan is one of many talented juniors at the club. We believe if you are good enough, you are old enough and we have a number of juniors in our senior sides. Studley’s junior training is held on Wednesdays from 6pm. The Washford Fields club’s all-star programme has commenced but it is not too late to sign up. DESPITE a heavy loss on Saturday, Studley skipper Chris Perrins remains upbeat about his new-look side’s ambitions in Warwickshire League Division One. Studley went down by 98 runs to Coventry outfit RMCC who batted first and posted a total of 225-9 off their 50 overs on an excellent surface. Andrew Rhodes’ 3-26 off ten overs was the pick of the bowling, but the hosts’ reply never really got going, with the captain top-scoring with 26. Studley slipped from 68-2 to 129 all out in 37 overs to ensure there would be no winning return to Warwickshire Division One after their first two fixtures ended in abandonments. Perrins felt the result was not a fair reflection of proceedings. “This is the first time we have played this year. The weather has been so bad, we haven’t been able to get on to the ground, so it was our first run-out,” said Perrins. “As expected, we were a little rusty, but there were lots of positives. A few decisions didn’t go our way but we move on quickly. Studley travel to Weoley Hill on Saturday (12.30pm).